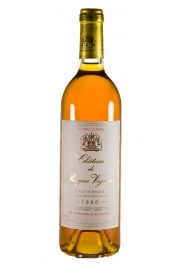 Château Rayne Vigneau is a sweet white desert wine produced in the Bordeaux appellation of Sauternes. 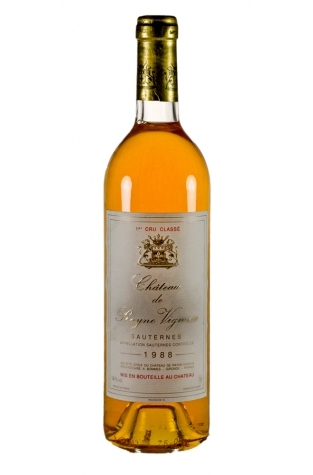 The 1988 is somewhat lighter than some vintages of this wine and displays fine balance with good acidity and a consistent aromas of apricot and honey. It offers a clean and crisp finish which is not at all cloying. Robert Parker compares the 1990 and 1998 saying "The 1988's flowery, peach and honey-scented nose and medium to full-bodied, complex, finesse style is more refreshing than the in-your-face, sweet, low acid 1990." The official classification of 1855 placed Vigneau amongst the first growths of Sauternes. In 1867, the famous wine broker Daney even gave it number one ranking, just after Yquem. The estate was finally given its current name of Rayne Vigneau by Albert de Pontac, the great nephew of Madame de Rayne.